There’s something exciting in store in Hamilton County, Indiana. Hoosiers seeking affordable, sleek furniture and home décor will no longer have to cross state lines to get their IKEA fix, because IKEA Fishers officially opens to the public Oct. 11. This is the first Indiana location and the 45th store in the United States. 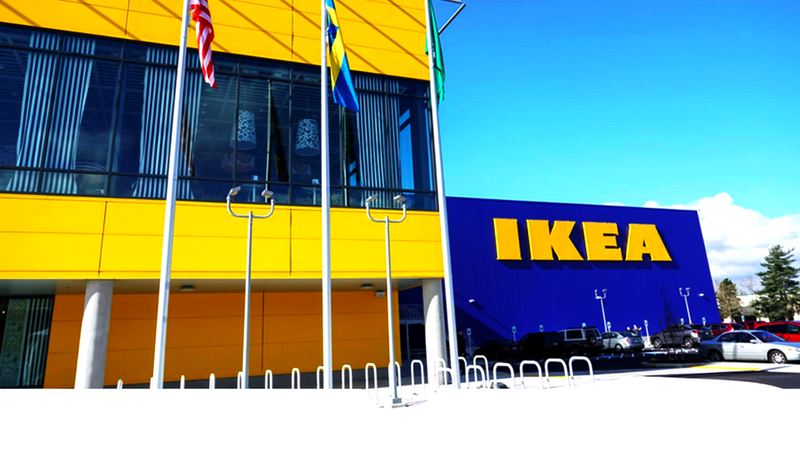 Since the announcement in 2015, IKEA fanatics (like myself) have eagerly anticipated the opening of this Scandinavian store, known for ready-to-assemble furniture and the iconic blue reusable shopping totes. Oh, and don’t forget the most delicious part of your visit - the famous Swedish meatballs. We got a special sneak peek before opening day. Learn the lay of the land and get a behind-the-scenes glimpse at the arrival of IKEA Fishers in Hamilton County, Indiana. To the first timer, navigating IKEA seems like a beast. You enter a blue and yellow warehouse that goes on forever with rows upon rows of furniture, both assembled and still in boxes. 1) Upon entering, you’ll first go through the showroom, where IKEA employees have carefully arranged the items for sale into mock bedrooms, dining rooms, kitchens and more to spark your inner HGTV interior designer. The key is to look but not take; rather, peer at the price tag and the red tag will indicate where to find that item later in the store in the self-serve furniture department. Take note on the provided notepad and pencils in store or write it down on your phone. Better yet, use the IKEA app to track your soon-to-be purchases. 2) Follow the arrows to take a self-guided tour through the entire showroom. There are subway style maps every so often to show where you are or ask a friendly IKEA employee to show you the way. Need to escape the furniture maze early because you’ve found what you were looking for? Follow the designated shortcuts for a speedier shopping trip. 3) Note that IKEA Fishers is one floor, unlike other two-story IKEAs. If you want to shop the marketplace or eat in the IKEA Restaurant & Café, you’ll need to navigate through the showroom first – this is where those shortcuts come in handy! 4) Speaking of the restaurant, it’s in the middle of the store when you exit the showroom and before you enter the marketplace. Take a break, grab some food and use the restroom before embarking on the second half of your mission. You can’t go wrong with the Swedish meatballs served with lingonberry sauce. Most meals are under $10 – in fact, you can get a breakfast plate for $1. What else can you buy with $1 these days? 5) From there, you’ll enter the marketplace – the land of accessories. Here the set-up is more like a traditional store, with shelves stocked high with plates, lamps, picture frames and more to decorate your space. 6) Your final stop (before the registers, of course) is the self-serve furniture aisles. Grab those notes you took earlier to find your armchair, dining room table and more. An IKEA employee can help with heavier loads and transport them to your car. For an extra fee, they’ll even assemble and deliver items to your home, so long as it’s within a one hour drive from the store. 7) Remember to wear comfortable shoes (it’s quite a bit of walking) and for your first trip, plan to browse and get the lay of the land. See all that IKEA Fishers has to offer, then make a plan for return purchases. As is tradition for IKEA, the store will open on a Wednesday. The grand opening is Oct. 11 at 9 a.m. The most dedicated shoppers can line up 48 hours in advance, and the first 45 adults in line will receive a free sofa. If you’re not keen on camping out, fret not – the next 100 adults will get a free armchair, and the first 2,500 shoppers will receive a prize envelope with gift cards ranging from $10-$250. Score! The deals continue through opening weekend and include the chance to win free meatballs for a year. IKEA is known for its affordable style, but to score even more great offers sign up for the IKEA family program, which is free to join. You’ll get perks like free coffee and tea in the IKEA Restaurant & Café – who doesn’t love free coffee?! IKEA Fishers is at 11400 IKEA Way on the southeast corner of 116th Street and I-69. The IKEA Fishers store is open 10 a.m. – 9 p.m daily The IKEA Restaurant and Café, which has a separate entrance and serves breakfast, lunch and dinner, is open 9:30 a.m. – 8:30 p.m. daily. What else is there to do in Fishers, Indiana? We&apos;re glad you asked. Luckily, IKEA Fishers is in a hub of activity. Within a mile radius you can find great food & drink options like Portillo&apos;s Hot Dogs, Four Day Ray Brewing, Nickel Plate Bar & Grill, Pure Eatery, Wild Ginger, Chatham Tap, LouVino, Sure Shot Coffee, The Well Coffeehouse, Handel&apos;s Homemade Ice Cream & Frozen Yogurt and more. Extend your stay with fun activities like The Escape Room, The Pint Cycle or the new Topgolf entertainment complex. Make a weekend of it and book a hotel that&apos;s close to all the action above! For more great things to do in Hamilton County, visit our website or request a travel guide. Keep up with what&apos;s happening in #VisitHC by following us on Facebook, Twitter and Instagram. Happy shopping!